Description: CN 148 heads east through Durand. Description: The WC sits in the clear off the main, as the CP has a Dresser Rock train headed for loading. Description: The transfer comes up from Northtown a little early today and is surrounded by a bunch of green trees. Telephoto shot 10X zoom, Nikon Fe photo scan. Description: The WC makes its way back to New Brighton after coming up from Humboldt. They would head back down to Northtown with BNSF 9765 to be delivered off to the BN. Description: After screaming up Shoreham Hill, the transfer cools its heals on New Brighton while it waits for an outbound crew. Description: After grabbing the CP cars on the Foley Wye, Charlie accelerates up grade with the GTW 5936 helping out. Description: CN 2638 leads (sadly...) the much more interesting unit, the GTW 5936. This was the first engine that has excited me about the Transfer in months! Description: CN engine # 2638 shoves freight cars back into the Eagle Mills Yard. Description: CN engines # 5664 & # 2638 shove covered hoppers back into the Eagle Mills Yard. 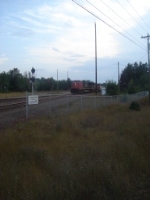 Description: CN engine # 2638 switching freight cars in the Eagle Mills Yard. Description: CN engines # 5664 & # 2638 shove a string of freight cars back into the Eagle Mills yard. Description: The G-EDUPEI is running again. Well see how long itll last this time hopefully forever. Description: I tried gettin his pic, but this was the best I could do. Description: Northbound manifest through Centralia.